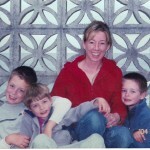 Photo of me and my three boys, 2004. Today I created an About page, a Subscribe link and its accompanying page, and improved my Gravatar Profile. I had some pages and posts done on my new blog, but the About page was still empty. As usual, I always like to look for advice from people who have done something (anything) before, whether they are experts or just those who have learned from experience, so of course I start with a Google search, or peruse the websites that are specifically about starting a new blog. I found very good tips from Michael Hyatt in his article, “10 WAYS TO CREATE A BETTER “ABOUT PAGE” FOR YOUR BLOG“. The items that I decided to use, of his 10 ways, included writing in the first person, which I would have done anyway, and just telling about myself and the blog. Initially I wrote too much, going into what I’ve been doing for the past decade in detail, and then cut it back. I figured that was just too much unnecessary information. And, I am reconsidering the order of the information on my About page, based on his advice. He suggests starting with the reader’s priorities before launching into my bio brief. It’s okay though, since he even included a commenter’s note that the About page should always be a work-in-progress, and revisited and updated frequently, keeping it current. So, at any time I can switch the order of the information, or the tone, add links to subscribe, etc. I also utilized John Saddington’s “Making the Best ‘About’ Page for Your Blog Ever!” John’s page provided the link to Michael Hyatt’s page. Both extremely helpful. John’s advice is direct but encouraging, and practical. Based on his words, I plan to add info about my own expertise, links to other pages within my blog, and then add links to the About page from elsewhere on my blog. Most About pages have a photo. Though I’m a bit uncomfortable making a page too personal, as I’m a very quiet person who does not like attention, I knew I wanted to include photos so readers can see who I am. I know I love to see photos of authors on blogs I read, and I always look for staff photos on company websites. It took me a while to decide on which photos to include. I was trying to consider the goal of the blog, the allover tone, and the privacy of my family members. 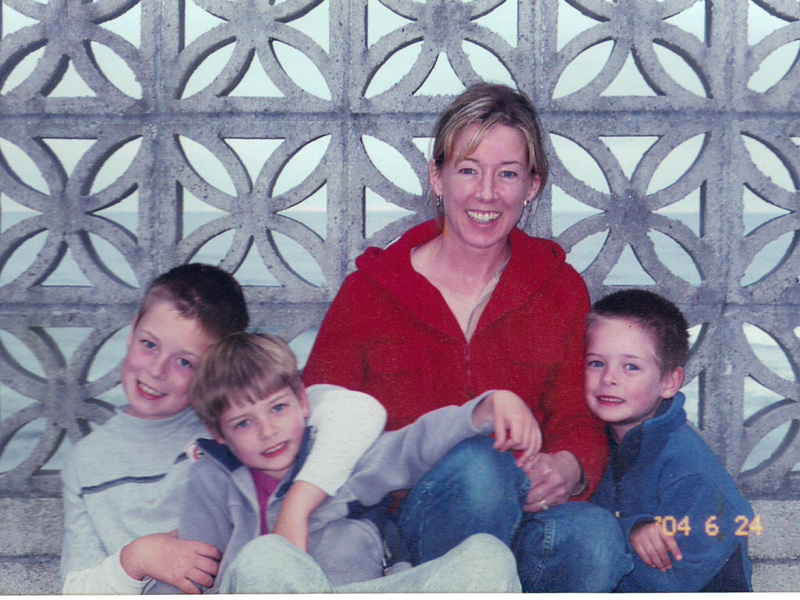 Ultimately, I opted for a photo of me and my kids when they were little, as opposed to a more current image. I figured that would highlight my previous full-time mom role, and emphasize that a lot of time has passed! At the end of the About page, I finished with a fairly current photo of me and my husband, without kids, sort of to indicate we are approaching a new phase of our lives, mirroring my new foray into this blog. I know, that might be too much deep thought about an About page. But, it’s a work in progress, and I can always change it up. This effort is also a work in progress. 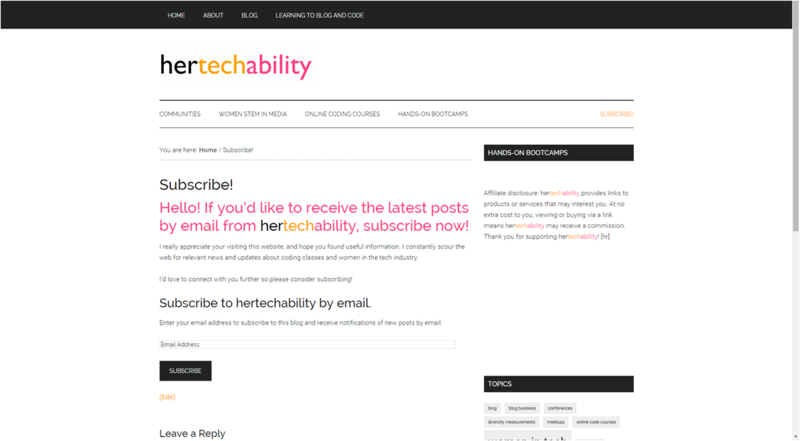 I know I want to develop an email list of subscribers. I’ve had experience with MailChimp’s free version to send newsletters, but now I want a system to send new blog posts automatically. And I want to emphasize the subscription signup option in the best ways. I’m still researching email subscription and marketing systems, and for now am using the included Jetpack subscription form. I followed the directions for the Jetpack form, but instead of placing a sidebar widget, I created a Subscription page, as outlined in Jetpack option #3, and inserted the form code there. I incorporated the colors and style of my blog theme, and tried to sound encouraging and inviting. Then I connected the page to the menu item on the navigation bar. I still need to figure out how to customize the wording on the page telling the reader to look for a confirmation email, and the wording on the confirmation page itself. Both look oh-so generic at the moment. Another work-in-progress! That customization will likely need doing through a plugin, maybe one with a popup option to activate later. Paying a monthly amount for a subscription service will take a while to reconcile in my head, since the blog is new and not generating income yet. Perhaps I’ll pay for a specific allotment of time, such as a year, and then reevaluate the value based on any income received or email list gathered. Here’s a resource created by Sharon Gourlay and detailed on her blog, Digital Nomad Wannabe, to help compare four email systems: MailChimp vs GetResponse vs Aweber vs Mad Mimi – Email Marketing Services Comparison 2015. I’ll keep referring to that in the next few days, and look for more reviews, as I decide which to try first. Finally, I beefed up my Gravatar profile. As I read through the Jetpack options, wondering what else my blog needs that I don’t even know about, I saw a widget feature for Gravatar Hovercard profile with photo. I have always enjoyed seeing a blog author’s mini-profile on a sidebar. So, I activated the Jetpack feature, then logged on to Gravatar to add a brief description of me. Unfortunately, when the feature was inserted to the sidebar, the photo was way too big! I didn’t see any easy way to reduce the size, so I decided to leave my Gravatar profile as is, but remove the Jetpack feature, and instead use the Gravatar brief description in a text box at the footer of my blog. I titled it “A Little Bit About Me”, though that sounds sort of silly, and may change, as well. I’m still trying to find my ‘voice’ and get my blog ‘tone’ nailed down.